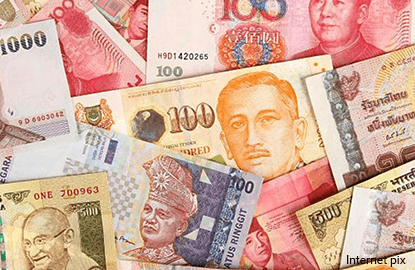 SINGAPORE (Feb 1): The South Korean won hit a 2½-month high and some other Asian currencies held firm, after comments from US President Donald Trump and his trade adviser raised fears that the United States may be shifting away from a "strong dollar" policy. Trump trade adviser Peter Navarro criticised Germany, Japan and China on Tuesday, saying the three key US trading partners were engaged in devaluing their currencies to US disadvantage. Asian currencies edged higher after the US dollar fell broadly on Tuesday in the wake of the comments by Trump and Navarro. "This suggests that perhaps there might be a shift in terms of the strong US dollar policy," said Khoon Goh, head of Asia research for ANZ. The comments by Trump and Navarro suggest that their preference is for a rise in the currencies of countries such as Germany, Japan, and China, against which the United States has a trade deficit, Goh said. If such trade frictions between the United States and its trading partners were to persist, it would not benefit global trade and would not be be positive for Asian currencies. The won rose to 1,153.4 per US dollar at one point on Wednesday, its strongest level since Nov 10. "We expect the US to start playing the devaluation game and its trade negotiators to cite large bilateral trade surpluses with the US as grounds for China, Japan and Korea to appreciate their currencies," Tim Condon, head of Asia research for ING said in a note. Elsewhere, the Indian rupee touched a high of 67.62 against the US dollar, its highest level since mid-December. The Thai baht edged up around 0.2% from levels seen in late Asian trade on Tuesday. The baht stood at about 35.14, hovering near a 2½-month high of 35.095 set on Tuesday. Most Asian currencies have risen since the start of the year, gaining as investors pared back their bullish bets on the greenback, which had rallied late last year in the wake of Trump's election to president in early November. "The euphoria has ended for now," said a trader for a Japanese bank in Singapore, adding that the US dollar seems to be in the midst of a broad pull-back phase for now. In addition to Trump's policies and remarks, the near-term focus for investors is the US Federal Reserve's monetary policy statement due later on Wednesday. While the Fed is widely expected to keep the federal funds rate unchanged at a range of 0.50% to 0.75% this week, investors will be watching for any changes in the Fed's assessment of economic conditions. * Taiwan's financial markets are closed from Jan 27 to Feb 1. ** Chinese financial markets will be closed from Jan 27 to Feb 2 for the Lunar New Year holiday.